Three horses running wild and free. 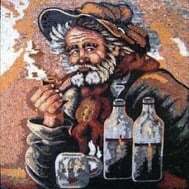 PROs: Handmade tile mosaic artwork composed of high-end natural marble tiles that is guaranteed to elevate your space. Mosaicist: Haith D.
CONs: With a taste of freedom, these beautiful horses may not want to stop running. Don’t worry, yours will always be there adoring your living space. This stunning tile mosaic art is perfect as a mural for any office, bedroom, living room, dining room or retail space. Our mosaics are made from natural marble and stones, naturally resistant to different environments (dry, moist or wet) and weather conditions (frost, sunlight or extreme heat).